Vitiligo is a condition that causes depigmentation of parts of the skin, characterized by presence of white patches on the skin. It occurs when melanocytes, the cells responsible for skin pigmentation, die or are unable to function. The goal of treatment is to improve the appearance of skin lesions. Depending upon the size, number and location of white patches, an individualized treatment plan (medical, surgical and adjunctive therapies) can be tailor made for the patient. In most of the cases, vitiligo can be treated with medication. Experts may suggest creams or gels to apply directly on the skin. Medical management requires supervision & expertise of a dermatologist. a. PUVA light therapy: This method is mostly used to treat the widespread vitiligo. UVA light coupled with a medicine psoralen is used to restore the colour of the skin. This treatment requires the expertise and supervision of a dermatologist. b. NBUVB light therapy: This method has become the treatment of choice for a wide range of population. It is therapeutically more effective with minimal side-effects. c. Excimer laser: If medication does not seem to work or yield the desired result, laser treatments can be used. Laser treatments display effective result within the expected timeline. In this method, laser is used to repigment the skin and restore the colour. Excimer laser is a 308 nm wavelength laser. The basic idea of vitiligo grafting is to donate or introduce normal, functioning melanocytes to the depimented skin. These functioning melanocytes are then expected to produce melanin pigment with eventual repigmentation of the vitiliginous skin. 1. 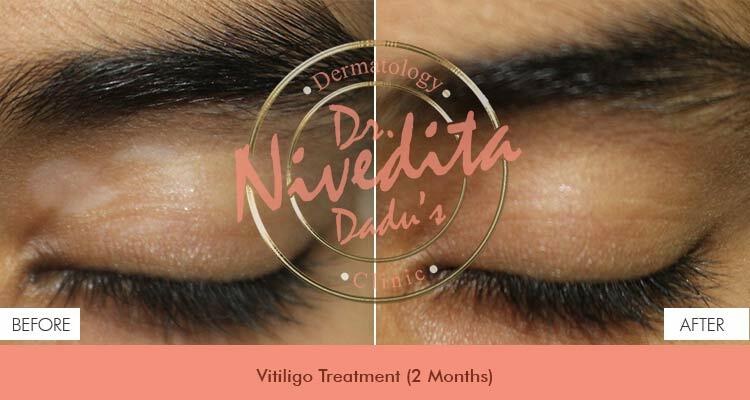 Stability of vitiligo: Surgery can be performed only if the disease is not active and the lesions are not spreading or expanding any where in the body. 2. Type of vitiligo: some forms of vitiligo respond better than the others. 3. Location of vitiligo on the body: some body parts respond better to grafting compared to other body parts. 4. Size and total area of depigmentation: Choice of procedure also depends upon total area to be treated. While tissues grafting procedures are better for smaller areas, cellular grafting remains the surgical treatment of choice for extensive vitiligo. Split Thickness Skin Grafting (STSG) (tissue grafting): This technique involves the transplantation of a sheet of epidermis with some part of the upper dermis to the recipient area. Melanocyte Transfer (cellular grafting): A split – thickness skin graft is harvested from a suitable donor area and this is treated with an enzyme. The different cellular components of a STSG are separated and a suspension is prepared out of these cellular components. The suspension contains epidermal keratinocytes and melanocytes. After the recipient bed is created, the cell suspension is spread thinly and evenly with a spatula on to the dermabraded recipient skin.